Sesame Workshop, Qualcomm and Two Bulls recently partnered to develop a new type of gaming experience for preschoolers. 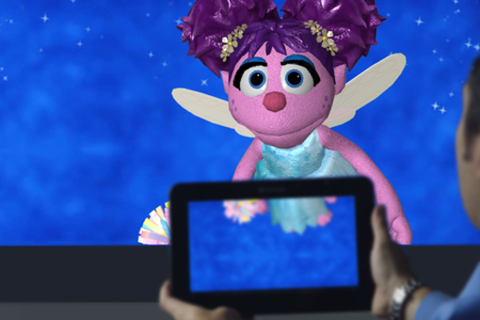 Using Qualcomm’s AllJoyn technology combined with the Unity SDK, this multi-screen game prototype sees Sesame Street’s resident fairy, Abby Cadabby flying from a television into a tablet screen and back again as she instructs, demonstrates and interacts with the child, opening up magical new interactive learning opportunities on the way! This panel will include the project team from Sesame Workshop, Qualcomm and Two Bulls and will focus on the technical and creative production processes in making an immersive multi-screen game experience using AllJoyn and Unity SDK for a preschool audience. Brian Vogelsang is Director of Product Management with Qualcomm Connected Experiences where he is responsible for identifying and developing new business opportunities for AllJoyn™, an open source platform enabling interoperability for the Internet of Everything. Brian has over 18 years of experience in telecommunications and Information Technology, with over a decade of experience in mobile applications development. Previously he served as Director of Product Management for Qualcomm Mobile & Computing (QMC). As part of the QMC Snapdragon™ Ecosystem team, he worked with application developers on new business, partnership, and innovation opportunities for Qualcomm’s Snapdragon mobile processor. Prior to this he served as Director of Product Management for Qualcomm Internet Services (QIS) where he was responsible for overseeing product development for Plaza Retail, the application store platform for BREW that generated over $3B in application developer revenues. Since joining Qualcomm in 1994, he has held management and product strategy roles in engineering, product marketing, Information Technology and product management. Prior to joining Qualcomm, Brian was Chief Technology Officer for AXNET Communications, Inc., a regional Internet Services Provider. He holds a Bachelor of Science degree in business management from the University of Redlands. Jessie Hopkins is a Senior Writer and Game Designer at Sesame Workshop. For over five years, she has written and directed Muppet character dialogue for Sesame Street games on a variety of platforms. She has also worked as a freelance games writer for Scholastic, Classroom Inc, and GeniGames. John oversees design and delivery of Two Bulls' tech productions for some of the world's leading brands and innovators. Covers novel and cutting edge smartphone/tablet/device tech from augmented reality, wearables, advanced audio/video engagement and 3D printing to gamification, education, social responsibility & empowerment and unforgettable brand building. Clients include Sesame Street, Qualcomm, Hasbro, GE and Groupon. Directs award-winning product design and delivery teams with a deep experience in human-computer interaction, UI design and building strong and trusted client relationships. John has a Computer Science / Software Engineering background in a broad range of environments, and has worked senior roles from tech entrepreneurial startups to multinational management/sustainability consultancies. Noah Harlan is a Founder and Partner in Two Bulls, a boutique technology services company. Noah is also Managing Director of Digital Strategy for Sullivan NYC, a leading brand engagement firm. Noah has served as an advisor for the White House Office of Science & Technology Policy on gaming and the outdoors, has appeared as a commentator on Bloomberg TV discussing mobile technology, and has an Emmy Award for Advanced Media Interactivity. Noah has an extensive background creating and producing a broad array of media content across nearly every platform over the past 15 years. He has produced six acclaimed feature films and has produced content experiences for brands including Audi, Chevrolet, Lincoln-Mercury, Southwest Airlines, and MTV.